Some years ago a few friends would gather under a small pop-up tent next to the UL baseball stadium, Tigue Moore Field, for football tailgating. Soon, other friends began to visit and participate in the tailgating activities. Things were good!! However, university scheduled outdoor improvements for this area claimed the group's tailgating site. A new site, across the street from Tigue Moore Field, became the new tailgating home. In short order, the group outgrew this site and moved to a new location nearby. The new location was larger, and the Krewe now had two lots as their tailgating site. Two, and sometimes three, small pop-up tents were required to shelter the group and the increasing number of visitors to the site. It was easy to recognize that we were now a true organization. A name was needed! After some discussion it was decided that Krewe de Chew was to be the name of the organization. It is a unique name that has an interesting play on Cajun French words. The increasing number of tailgating participants necessitated some organization to prevent the duplication of entrees and side dishes. This was accomplished by forming teams for each home game. These teams furnish the entree(s) of their choice. Side dishes and desserts are furnished by the remaining members of the Krewe. The Krewe outgrew its site and moved to its present one, which consists of three lots and accommodates several large tents to shelter the Krewe and its numerous visitors. The present site abuts the west side of the Maintenance Building, which is located across the street from the first base side of the baseball stadium, Tigue Moore Field. 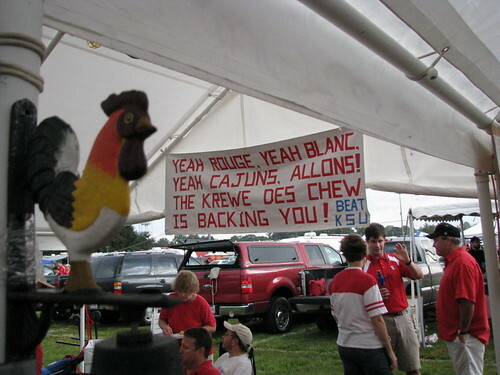 The site is easily recognized by its large white tents, the large Krewe de Chew signage, and numerous UL fans and fans of visiting teams enjoying a unique tailgating experience. The Krewe is not a formal organization. There is no charter and no officers. Members pay an annual assessment to cover the cost of the tailgating sites, maintenance of tents, storage space, etc. There are no written rules or regulations. The only thing perceived to be a rule is that dishes are to be "made from scratch". There are some exceptions to this "rule", such as Cajun boudin and cracklins, but no fast food fried chicken or other such items! The Krewe functions on the good will and sensibility of its members. This, along with its desire to support the university and our joie de vivre, contributes to our success. * Jay Eller is a retired Army officer and a die hard Troy State fan. He reports on all Troy University football games, home and away, for local newspapers. This is his description of the Krewe's Homecoming 2005 tailgating. * Johnny Weatherford is a die hard Troy State fan. This was an email he sent the Krewe de Chew describing his experience at the Krewe's 2009 tailgating for the UL vs. Troy State game.